Simply a great idea and the right thing to do will always prevail whatever obstacles are placed in front of it. Tidal Lagoons are a fundamental part of the UK’s energy security, supply and form an important part of our low carbon generation not to be developed. 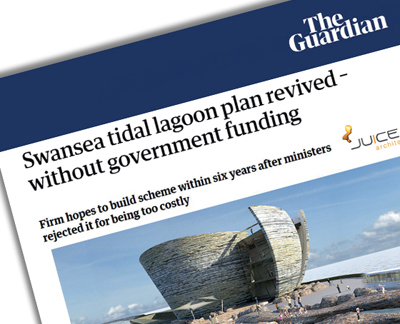 The Tidal Lagoon Power company are now progressing a public-private partnership opportunity that society needs, with industry and local authorities to bring the project forward. Our Visitors Centre has become the iconic landmark that now represents the clean renewable energy that this Pathfinder project will generate ahead of the tidal lagoon fleet around the UK, and we look forward to the project progressing. We travelled to Valencia on Thursday for our European Study Tour, returning late Saturday after a jam packed visit with warm late summer sunshine and cloudless skies, not to mention the tapas, rioja and paella. The trip had the perfect guide in Agustin who has lived in Valencia most of his life and provided us with an in-depth knowledge that revealed the many facets of the city, including its architecture, culture, social life and culinary aspects that most visitors do not have the privilege of exploring. After a relaxing meal on Thursday evening, Friday came with an early start and a meandering walk through the nineteenth century eastern quarter before entering the old town at the Western Gate. We explored the town’s medieval layout, monuments and ancient buildings, including La Lonja de la Seda with its unique twisting columns. After visiting the Mercado Central, Valencia’s eye watering principal food market, we enjoyed a welcome break for lunch of Spanish sausages and Pan con Tomate. Back on our feet, we left the old town via Torres de Serranos to walk along the Jardines del Turia, the new linear park running along the original route of the Rio Turia created after the river was diverted following major floods within the city. Enjoying this unique park environment where citizen’s can relax away from the traffic and bustle of the city, we headed towards the most concentrated group of buildings by Valencia’s famous architect and engineer, Calatrava. It is almost impossible not to take great photographs, especially as the sun starts to drop in the sky at dusk. 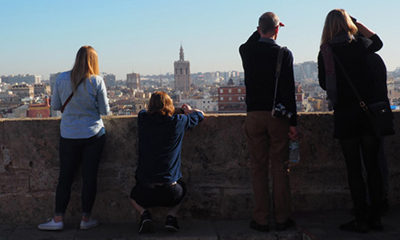 However not all Valencian’s are in awe of the aftermath of this iconic part of the city and tourist attraction, as they are huge costs to maintain the buildings and obsolescence to manage and overcome. The last leg of our day took us down by the harbour and Chipperfield’s America’s Cup Building, ‘Veles i Vents’. The focal point for Europe’s first hosting of the Cup in 150 years in 2007, it now stands sadly without accommodating any real use. Relaxing with a beer or two in a bar on the Paseo Maritimo by the Playa del Cabanyal we debate the value of status buildings without sustainable futures. Finally the end of the day, after walking 20k, back to the centre for more tapas and beers. Saturday starts with another visit to the Mercado Central before driving out to the Parque Natural de la Albufera to explore to southern region and the rice fields. A long walk along the beach before visiting El Palmer for the best paella in Spain according to Agustin, and who are we to argue – just enjoy! And so back to the airport. Finally some heartfelt thanks - to Agustin for explaining and guiding us through parts of Valencia with we would not have known about and especially to the team who stayed back in London and were unable to join us this year.